The heroes of The Emirates FA Cup Third Round have been immortalised in a limited-edition Roy of the Rovers comic, released today! That's right, we've teamed up with The FA to bring you the Roy of the Rovers FA Cup Heroes Special - and you can download it right here, for free! 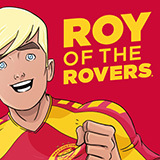 You can also read this epic special edition on the Roy of the Rovers app - simply search for Roy of the Rovers on your app store of choice, download for free, and get reading! The commemorative special issue depicts action from an exhilarating Emirates FA Cup Third Round weekend which saw Barnet, Gillingham, Oldham Athletic and Newport County all overcome the odds to record famous upsets. Following Oldham Athletic’s and Newport County’s stunning victories against Premier League opposition, the managers of both sides described their achievements as “Roy of the Rovers stuff” and the new comic features a cup themed storyline and artwork by Roy of the Rovers artist Ben Willsher. DOWNLOAD YOUR FREE COPY OF THE ROY OF THE ROVERS CUP HEROES SPECIAL! We're sure you'll all agree, it's real Roy of the Rovers stuff!